And I was about to find out why. These fish are the mature version of the small juvenile puppy drum that many of us catch on light tackle in the surf and in the backwater sound marshes and are really a completely different sub population of the same fish. The old drum range anywhere from 20 to 40-plus years old. With the smaller drum we are fishing, the puppy drum, they are one to three to five years of age, and as they mature, their preferred habitat and eating habits change. 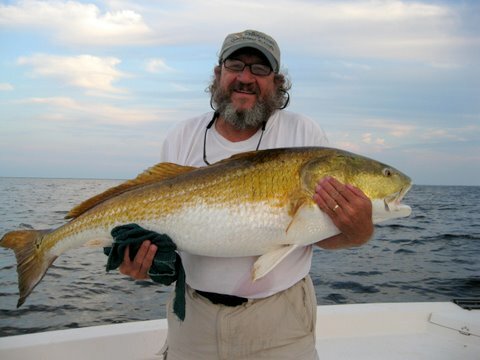 So on a sultry September late afternoon around 4:00 p.m. we left the NC Wildlife ramp at Salter’s Creek, heading out Turnagain’s Bay to a large oyster reef somewhere in the Neuse River, Pamlico Sound area in search of the legendary big red drum. 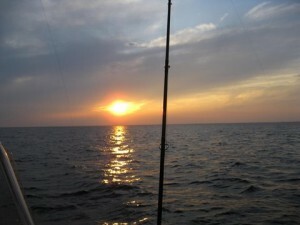 As we cruised out to our fishing hole, we talked gear. Goodwin uses both 25-pound monofilament line and 50-pound braided line on his reels. Terminal tackle is extremely important and, since this is exclusively a catch and release fishery, is now mandated by recent NC Division of Marine Fisheries regulations. At about 4:30 we arrived at a live bottom oyster reef in about 13-feet of water and baited up the 5-rods with chunks of fresh menhaden. For the first hour or so we did nothing but change bait every five or 10-minutes due to the abuse of crabs, pinfish and other bait stealers. We had just re-baited each of the rods and set four in the rod holders, while I cast the fifth bait out and slowly retrieved the bait when I had a pickup. Fifty feet of line stripped off in a heartbeat, but the circle hook missed the drum’s jaw. By the condition of the bait it looked as though the menhaden had gotten by the drum’s “crusher” and into the gut and as programmed came out without gut hooking the fish. That missed fish seemed to start off something of a blitz situation. Indeed, we had pretty much steady action until it was too dark for us to see the rods and our lines, and that’s when we stopped fishing. I picked up the rod, the one in the left in the back of the boat, and the first thing I felt was the power of that fish. We had the drag tight enough to wear him down which means that they are pulling pretty hard against YOU too. Well, this fish went around one side of the boat luckily went under the anchor line then over the anchor line and back to one side then when we finally wore it down after 10-maybe 12 or 13-minutes when Goodwin cradled it in his arms and boated the drum, about 40-pounds. But the thing that struck me the most was the beautiful color of this fish, a bright brilliant orange. We got the pictures! Fish color for these drum ranges from very silvery for the ocean going fish, to copper or dark bronze for fish holding way up the Neuse River over dark muddy bottom to this brilliant orange fish found mainly over the lighter sandy bottom of he Pamlico Sound, at least that’s one theory. 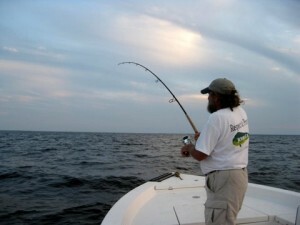 Were-baited and almost immediately we had another fish on, so I went to the back of the boat and grabbed the bent rod. They guess what…double header, two fish on! So Capt. 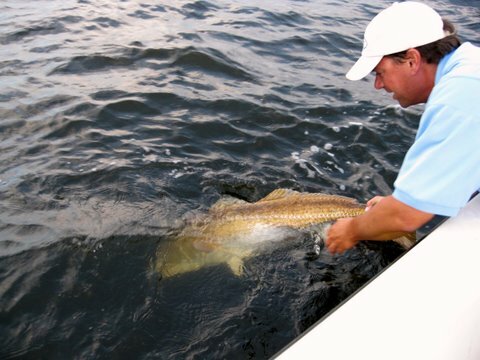 Goodwin is fighting the “big one” and he’s at the bow leaning backward to keep pressure on the fish so he doesn’t end up in the water and one by one we landed my fish and the big one, certainly over 50-pounds and loaded with spots. A beautiful fish. But it was getting pretty dark by then. And guess what is going on in the background? The military was putting on a great show for us out at Piney Island bombing range. By that time that’s as much light as we have had as it was getting dark. The tracers were lighting up the sky. “The tracer fire coming off of the helicopters was magnificent that evening,” admitted Goodwin. That last fish that we got, between the tracers…we were just outside the firing range zone. I was counting six-seconds, so I’m guessing we were only about a mile away from where all the action was going on. But the Capt. really wanted to catch one more fish before we called a day. We were pulling up the lines one at a time, getting ready to return to the dock, and finally one of the remaining rods went down. So I ran over there. This was…boy it was dark out there. It was awfully dark by the time we got that last fish on. Trying to fight a fish in the dark, do you do that often? Between the bioluminescence and the military we had some light, and we landed that fish in the dark, revived it and let it go, our sixth release of the day. To save the batteries, Goodwin intermittently turned the LED spotlight on and off giving a strobe light effect. It was sort of surrealistic; red flashing military tracer rounds in the night sky, green bioluminescence swirling in the water and now the bright blue-white strobe light flashing nervously along the narrow tree lined canal in the near pitch dark! Anyhow, we returned safely to the Salter’s Creek Wildlife boat ramp, and trailered the boat after a great evening of drum fishing. Capt. Goodwin told me that these old drum were his favorite fish to catch, and now they are mine too. Capt. 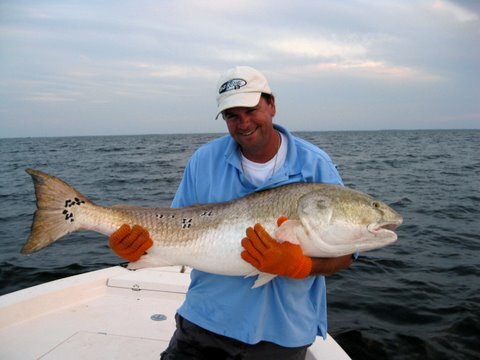 Bryan Goodwin, Native Guide Service, Beaufort, NC. http://www.nativeguide.net/, for video and TV times for Capt. Goodwin’s fishing show (Down East Outdoors TV), http://www.DEOTV.net, Phone: 252-725-3961 E-mail: bgoodwin6@ec.rr.com.